What are typical Amish jobs? What are unusual Amish jobs? How do Amish get to work? No. In fact, in 2015 it’s probably safe to say that most Amish are not farmers. While dairy farming remains a valued profession, the price of land and large families have compelled Amish to develop expertise in other fields. Woodworking, construction, manufacturing and retail sales are important industries for the Amish. Read about typical Amish businesses. What are some typical jobs Amish do? Home construction, crafting furniture, machine and engine repair, food stands, factory work, produce farming, raising livestock, small retail stores such as bulk foods and variety stores, auctioneering, and craft making/sales are among the jobs you’ll find Amish men and women doing. Yes. Besides their work as mothers, Amish women are tasked with running the household, which involves preparing meals, readying the home for church and other visits, planting and tending the garden, canning and processing food, and many other tasks. But quite a few Amish women take on additional jobs to generate an income as well–whether it be quilting in the home, running a roadside stand, baking, or operating a food stand at a Pennsylvania Dutch market. However, men are expected to be the primary earners in Amish homes. What are some unusual Amish jobs? There are quite a few atypical jobs – casket maker, CNC technician, strip miner, beekeeper, book rebinding, railroad work, nursing assistant, granola manufacturer, and chiropractor are among jobs Amish list as their occupations in church directories. Read more. Amish who work for a local employer may walk or ride a bicycle or scooter to their workplace. Those who work at a more distant location, such as at a Pennsylvania Dutch market in a city, or for a construction company where job sites change regularly, will be taken to and from work by a hired driver or non-Amish employee with access to a motor vehicle. More questions on the Amish? Get answers to 300+ questions in 41 categories at the FAQ main page. Meyers, Thomas J. “Lunch Pails and Factories.” The Amish Struggle with Modernity. Kraybill, Donald B., and Marc A. Olshan, eds. Hanover, NH: University Press of New England, 1994. Kraybill, Donald B, and Steven M. Nolt. 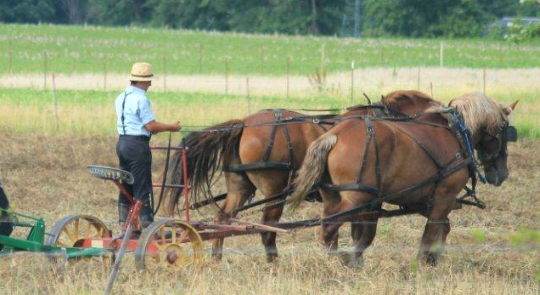 Amish Enterprise: From Plows to Profits (2nd ed.). Baltimore: Johns Hopkins University Press, 2004. Hurst, Charles E., and David L. McConnell. An Amish Paradox: Diversity & Change in the World’s Largest Amish Community. Baltimore: Johns Hopkins University Press, 2010. Kraybill, Donald B., Karen Johnson-Weiner, and Steven M. Nolt. The Amish. Baltimore: Johns Hopkins University Press, 2013. To Cite this Page: Wesner, Erik J. “Work.” Amish America. Erik Wesner, 16 Feb. 2015. Web. [Date Accessed]. <http://amishamerica.com/work/>. Do Amish happen to hire Englishers to work on their farms, stores, or manufacturing shops (such as metal/wood work/repair shops) at all? They tend to more often hire within the community, but some definitely do. Many companies will have one non-Amish worker who can also serve as a driver, especially builders. However the largest Amish company I know, a wood related business, actually has a majority of non-Amish workers. Thank you for the quick reply and great information, Eric. Is your e-mail still ewesner@gmail.com? I would love to pick your brain on somethings. I want to work for an Amish!!! I want to work for an Amish!! If you “left the English”, what would you gain?